Buckle up, we’re moving into the Top 5. 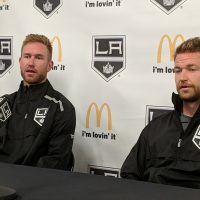 As we move through the 2019 edition of the LA Kings Prospect Rankings, it’s always helpful to quickly update anybody stopping by for the first time. If you’re unfamiliar with our rankings, for nearly a decade this content has become a vital source of player information. 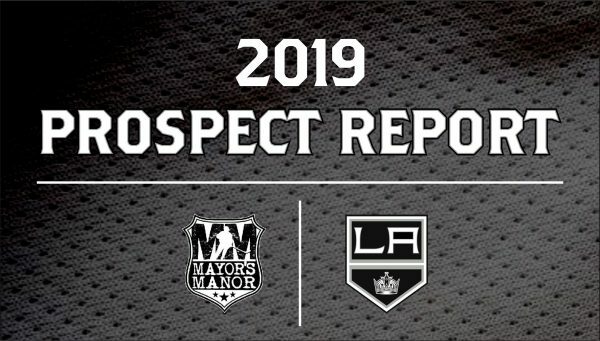 Nobody outside the Kings organization talks to more coaches, scouts, and General Managers about LA’s top prospects on a regular basis than the team at MayorsManor. Endless hours go into evaluating players in the Kings pipeline and preparing our write-ups. Additionally, the final slotting of players is influenced by hundreds of hours of game action and debating the team’s prospects with a myriad of well-respected hockey people, including our key sources inside the team’s front office. Later, in a different conversation, we were reminded of something many in the hockey world – including scouts and General Managers – fall victim to; a younger player is often thought to have more value than a near-NHL ready prospect playing in the AHL. Despite this type of thinking often not being warranted, it doesn’t stop it from happening. For example, it’s almost crazy to think that Clague’s stock in the NHL world was probably higher heading into the WJC last season. Although he’s done everything asked of him, he’s one year further down the development curve, and even knocking on the door of being an NHL player. Such is the life of an NHL prospect, where value is more arbitrary than definitive. Through the years, we’ve often skewed our Prospect Rankings by placing a greater weight on NHL-readiness, so this may seem like a bit of a contradiction; however, this time, Anderson’s more complete, all-around game, gives him a slight edge over Clague. It’s the slimmest of differences and you could easily argue flipping the order of these two players. If going out on a high note was the key, Kale Clague accomplished just about everything short of a Memorial Cup in 2018. Things really heated up just after New Years, when he served as an alternate captain for Team Canada en route to a gold medal at the World Junior Championship in Buffalo. Back in the WHL, he was traded from the Brandon Wheat Kings to the Moose Jaw Warriors, and never missed a beat. After positing 71 points and a plus-42 rating in a combined 54 games, Clague punctuated his season by being named the WHL Defenseman of the Year. 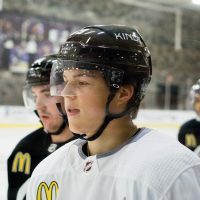 Give him one year of seasoning in the AHL and then look for him to be with the Kings to start their 2019-20 campaign. Clague is a highly intelligent puck moving defenseman… The team just needs to be a little patient, as it will take Clague time to fully develop. His skating and ability to make plays are already near NHL level. Conversely, his strength and defensive play will need to improve before he becomes a full-time player in the Kings lineup. … He is perhaps best described as a hybrid of Slava Voynov and Alec Martinez. He can create artificial speed by moving the puck up ice quickly. Like a quarterback in football, he’s also able to locate first and second options very quickly. … Additionally, Clague adds a different dynamic to what the Kings have right now in their D-core, especially on the offensive side of things. Checking in on him 12 months later, things are pretty much on target. Coming into the 2018-19 campaign, Clague’s first as a pro, there were some concerns about his ability to play hard, get back to pucks, and make plays under pressure. These are all natural worries for a player graduating from the junior ranks, where defense-first is not the primary focus. You have to be a competent defender at the pro level, you don’t have to be in junior hockey. To be clear, Moose Jaw didn’t trade multiple draft picks to acquire him from Brandon to have him play defense; they wanted his offense. By contrast, the Reign want Clague, and all other prospects, to focus on defense first. To his credit, the 20-year-old defenseman has quieted any worries by playing a real steady game and has taken significant steps forward in his development. Don’t be alarmed by his drop from No. 2 in last year’s rankings. This has more to do with the talent the Kings have either drafted and/or developed over the past 12 months. 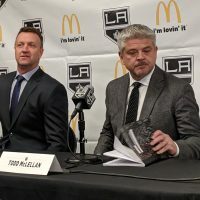 While he and Gabe Vilardi were once the superior prospects in the pool, GM Rob Blake has done an admirable job of restocking the pipeline in a very short period of time. Specifically focusing on Clague, one Kings executive told us that he is probably the defenseman who has taken off the most under coach Mike Stothers in Ontario. While that may be true, it just hasn’t been a very linear path. From our reports, things were a little sketchy early on, then there was a hiccup (read: healthy scratch on November 25th). Since then, there has been a steady rise. It has been noticeable to everybody who has watched Clague in the AHL this season – since around December 1st, he’s taken his game to the next level. It’s also been shared with us that Sean O’Donnell, who does a lot of work with the team’s defensive prospects in Ontario, thinks Clague is close to being ready for primetime. Most in the organization seem to agree with that assessment. Clague is looking more comfortable in game situations and carrying himself like a pro off the ice. “The attitude and approach are much more positive in recent times. After a rather slow start, he’s been getting better every day,” said another Kings executive, when asked about Clague’s maturation process. Stuts w/praise for Clague's improved play – "He's been really good; starting to show his skating ability & get into plays. His skating allows him to do a lot of things for us, create offense & defend. Looks more like the player we were told about… [He's] growing and maturing." Clague told me he was excited coming into the weekend, knowing he'd get some good opportunitiea with Brickley/Walker up w/LA, and wanted to up his play – "I wanted to come out of the weekend better than I was going in… Think I've come a long way from beginning of the season." Clague also credited Sean O'Donnell, who has been working w/ the defensemen this season; and Stothers – "Stuts has been on me, and that's helped a lot. He let's me know if I'm not playing as well as I should be. I'm excited about the direction of my game. Only gonna get better"
Clague is often described as a defenseman built for the new NHL. He’s an exceptional skater (and is encouraged to use that more to his advantage), yet the coaching staff wants him to show more than one gear to allude the opposition. With time and more experience, there is a general expectation that Clague will improve in his ability to defend and end plays in his own zone. Listed at 6-foot even, he’s not a heavy or punishing defender, like Kurtis MacDermid or Jake Muzzin, but his skating and mobility make him comparable to Kris Letang or Erik Karlsson. Strong hockey sense and solid reads make for good first passes and outlets. He’s effective at the point on a power play, while overall consistency and playing out of his comfort zone still requires some improvement. He also continues to work on better puck retrievals and the use of deception. Again, none of this is cause for worry. The Kings are pleased with his progression and are confident his offense will continue to grow as he becomes more comfortable at the pro level. Look for Clague to get called up to the Kings NHL roster soon, perhaps in early March. When the 2019-20 season opens in October, Clague may be slotted in as that second-pairing offensive threat they’ve been looking for in recent years. If it’s flash and sizzle you’re looking for, Anderson is not the player for you. However, if you respect and appreciate a complete, well-rounded player, pay close attention as things could move quickly over the next 60 days. This Minnesota native is likely turning pro in April and there’s even a slim chance he could sneak into a game with the Ontario Reign before this season wraps up. First, though, Anderson and his UMD teammates will be looking to successfully defend their 2018 National Championship. After being ranked in the top-5 for several months, their final matchup of the regular season will be huge; when they visit No. 1 ranked St. Cloud State. 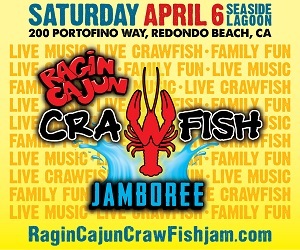 That two-game series will take place March 8 and 9, with the opening contest getting nationally TV coverage. We had Anderson listed at No. 10 last year and many people found that a bit surprising. Nobody is sleeping on him now, though. 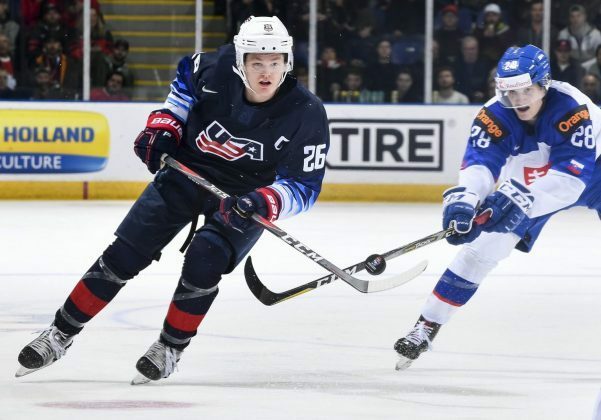 As the recent World Junior tournament went along in Vancouver, Anderson – who served as captain for Team USA – played in all situations and was a big part of his squad’s silver medal run. 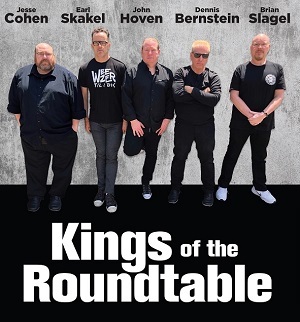 Kings officials, and other NHL scouts on hand for the tournament, continually raved about his performance when we often caught up with them in-between games to compare notes. 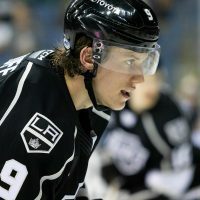 Of all the LA Kings prospects I asked about, though, who received the most praise? Mikey Anderson of USA. One scout said he thought Anderson has been the best defenseman in the tournament thus far. High praise. That same executive repeated what we said several times throughout the WJC, Anderson was arguably the best player on Team USA because he was the most complete. He played the most minutes and he played in all situations. Further, he was able to consistently elevate his game in key moments. Just 19 years old and a second-year college player, Anderson has been UMD’s most consistent defenseman thus far this season. He plays top minutes, seeing time on both special teams units. From the start of the season forward, his game has been incredibly consistent, in regards to his game both with and without the puck. His puck movement, both from breakout and in transition, is a defining quality in his game. Anderson makes quick plays up ice in both areas. Although his offensive numbers are down slightly from a season ago (the goals are there, but the assists are off), the team lost a lot of scoring from that group. His offensive game is solid, in particular on the power play. When you think about the Kings next season and beyond, Anderson’s strengths will compliment the team’s direction. His ability to quickly and effectively move pucks up ice remains a key strength, and one the Kings covet among their prospects. The organization loves the fact is very driven and competitive. He accepts any role and is willing to pay the price to make the little plays that don’t end up on score sheet. The USA coaching staff made it a point to mention how impressed they were with his play and more so his demeanor as a leader. Look for a continued change in his physical development over the summer. We’ve already seen a noticeable difference since Development Camp last July. Strength and conditioning will be a big offseason commitment for him, but he seems very driven in that aspect. One would be a fool to dare question Anderson’s willingness to attack his off-ice training, which will only help accelerate his development towards being an NHL player down the road. We expect Anderson to wear a letter in Los Angeles before all is said and done. 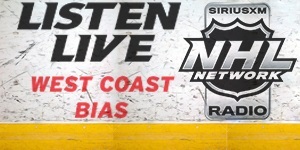 As always, many thanks to the numerous hockey sources who contribute to this series. Their ongoing input regarding prospects continues to be invaluable throughout this process. 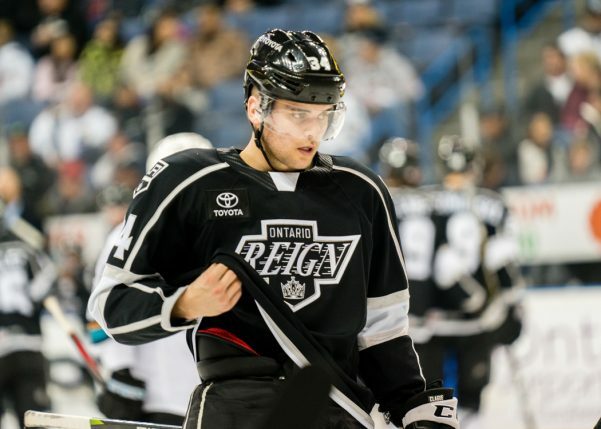 I hope that Kale Clague can be another Voynov for the Kings. While the “fall” of LA is due to several factors, I think that Voynov’s departure is the single largest factor. Losing a member of Dean Lombardi’s staple core (2 Centers, 2 D-men, and a goalie) for nothing with no warning was horrible. If Clague can fill that role, and Anderson can fill a leadership Greene type role (more leadership and intangible comparison, not skill comparison), that would be huge for LA’s quick retool. For fun, my “way to early to guess, post-retool D-core” is: Forbort-Doughty, Phillips-Clague, Anderson-Walker.